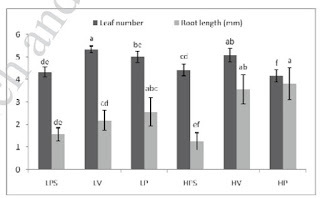 In order to improve the quality of in vitro Dendrobium plantlets for transplantation, the effect of photosynthetic photon flux (PPF) and supporting material on growth and development were studied. 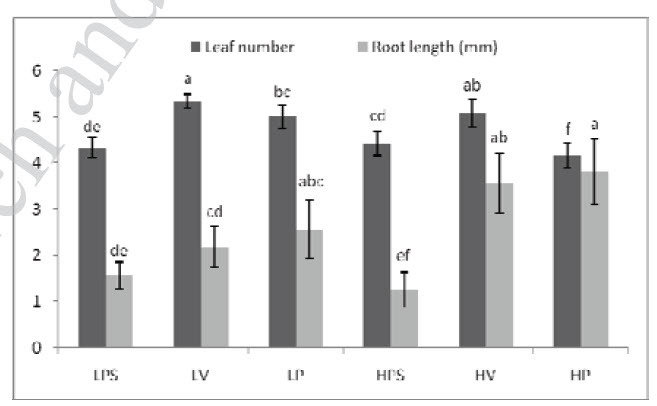 The in vitro derived shoots each with 3-4 expanded leaves were cultured on Vacin and Went medium vithout sucrose using 2.4 g 1-1 phytagel or 15 g per bottle vermiculite as supporting material. The shoots cultured using phytagel and vermiculite were then incubated in plant growth chambers under 50 mmol m-2s-1 or 150 mmol m-2s-1 PPF for 30 days. The other two treatments were provided as follows: the shoot cultured in the medium supplemented with 2.4 g 1-1 phytagel with 20 g 1-1 sucrose under 50 mmol m-2s-1 PPF or under 150 mmol m-2s-1 PPF. Sugar free media significantly promoted the growth and development of plantlets (total fresh and dry weight, root length, number of leaves). The plantlet growth could be improved by using vermiculite or phytagel as a supporting material in sugar free medium under mmol m-2s-1 PPF.